Bill's Movie News and Reviews: Vertigo: the greatest of all time? I’ve seen Alfred Hitchcock’s “Vertigo” twice, have the Blue Ray DVD, and most recently saw it in a theater in 1996 with a 70 mm reprint of the original 1958 Paramount VistaVision film (distribution changed to Universal with the reprint). Is it one of the “greatest of all time”? (Sorry, Timo, Richard Harmon isn’t in it.) The film is famous for its treasure-hunt plot and its use of mistaken identity (or perhaps deliberately forged) as retired police detective Scotty (James Stewart) falls in love with a woman he is hired to stalk, loses her once in a famous staircase and belfry tower jump, then finds her and chases her all over again. The film opens with the rooftop scene that does conform to the expectations of conventional screenwriting, to put the hero or protagonist in dire trouble right at the very beginning. Then there is a long conversation with Midge (Barbara Bel Geddes) in a San Francisco apartment, that seems talky by today’s standards, before he meets the shipping magnate Gavin (Tom Helmore), who hires him. The bifurcation of the film with the first jump scene gives it a two-part “Op. 111” structure (“Body Heat”, in 1980, would do something similar). Scotty also has to deal with the idea of cowardice after he supposedly failed to act at the first jump. The obsession with Madelaine (Kim Novak) reminds me of a sense of loss that happened earlier in my life (1978). Don't forget Bernard Herrmann's creepy score, especially the opening theme. 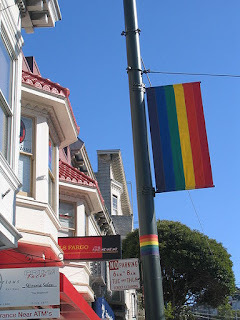 San Francisco has the charm here that only hints of its future as a “gay” city. I would first see the city in December 1966 as a grad student. Wikipedia attribution link for p.d. picture of Castro Street today.